The raw material is recycled, low density polyethelene impregnated with Ciba-Geigy HAL UV stabilising agents. 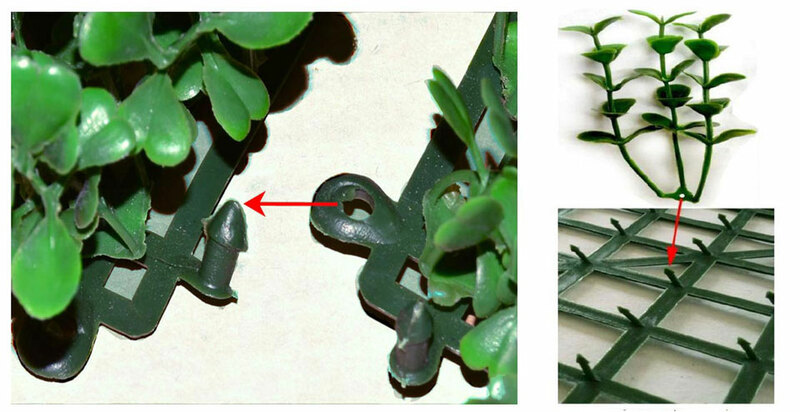 The artificial leaf tiles are made of plastic leaf sprigs attached to a plastic mesh.There are two components: leaf sprigs and mesh tiles. The sprigs push on to nodules at the grid junctions of the plastic mesh. The smallest unit is 25cm x 25cm. Push on male/female connectors join the tiles to give seamless greenery. The tiles come with leaf attached and ship as 50cm x 50cm modules. Cleanliness of plastic eg. lead, cadmium. Readyleaf willow and artificial leaf screens can extend out to 2.7m in length. The trellis concertinas out gradually lessening in height as the length grows. As shipped in its back it stands 1.3m high by 60cm wide. The leaf is densely packed in this form but becomes less dense as the trellis extends out. The trellis is made of natural willow and the foliage is UV stabilised so can be used outside and won’t fade in sunlight. Readyleaf trellis can be cut to length if required but the junctions where the willow poles meet need to be tied off so the end is secure.